AMG has announced that it has completed the supply of the transmission solution for a security and surveillance project for the Kai Tak Cruise Terminal in Hong Kong. 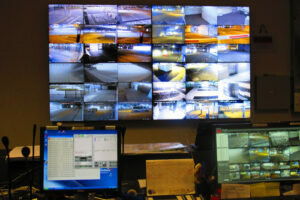 Designated as the ‘Design, Supply, Delivery, Install, Testing, Commissioning, Warranty and Maintenance of interconnected Closed Circuit Television (CCTV) System at Kai Tak Cruise Terminal, for Hong Kong’s Customs & Excise Department (C&ED,) Hong Kong Police Force (HKPF), Hong Kong Immigration Department (ImmD) and Tourist Commission (TC)’ the solution was designed and implemented by Hong Kong based UniVision Engineering. In total, the Kai Tak Cruise Terminal CCTV solution has 620 cameras. Of those, 260 comprise the designated TC solution. The 620 cameras are split into 220 IP PTZ cameras, 240 analogue PTZ cameras and 158 fixed, as well as two 360 degree cameras, with panoramic views. The solution has intentionally been designed with the possibility for expansion, and this is significant, as there are plans for further berth extension to be completed by 2018.